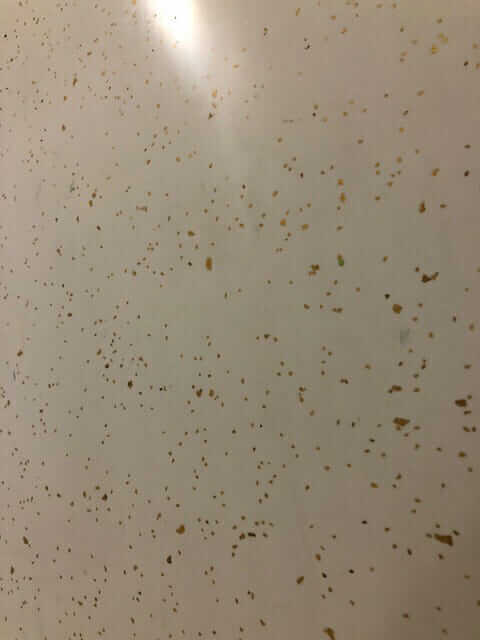 Glitter laminate cabinets … patterned laminate countertops … tiny metallic random mosaic tile on the walls… and terrazzo-like vinyl on the floor! 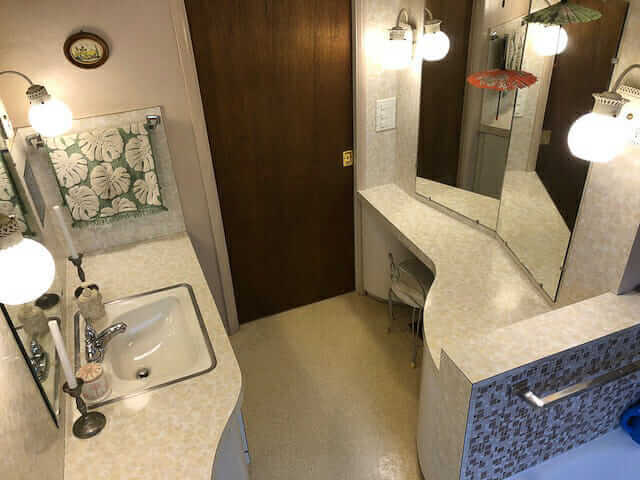 Laura’s 1957 bathroom has crazy wonderful pattern galore — this is one of my favorite vintage bathrooms ever — come inside and see for yourself! 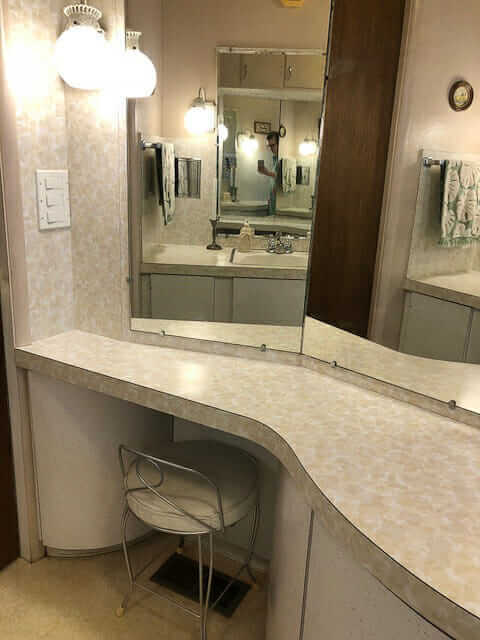 Here is our main bathroom in our 1957 home. We are the second owners and have lived here for almost three years. We bought it from the daughter of the family who literally built it. Her father was an instrument maker and his father was a carpenter, and from my understanding, the two of them built the house. I asked Laura, What did you and your family *think* of that crazy wonderful bathroom when you first saw it?? 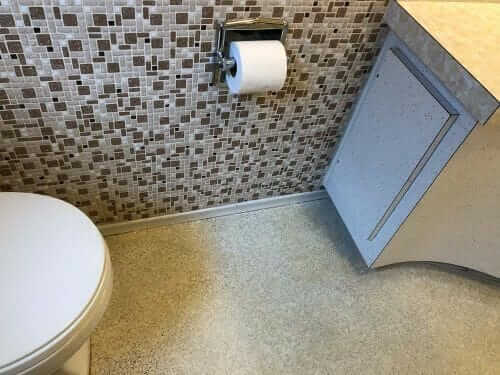 The realtor called us and said she had found the perfect house for us but that it needed updating in the bathroom and kitchen. 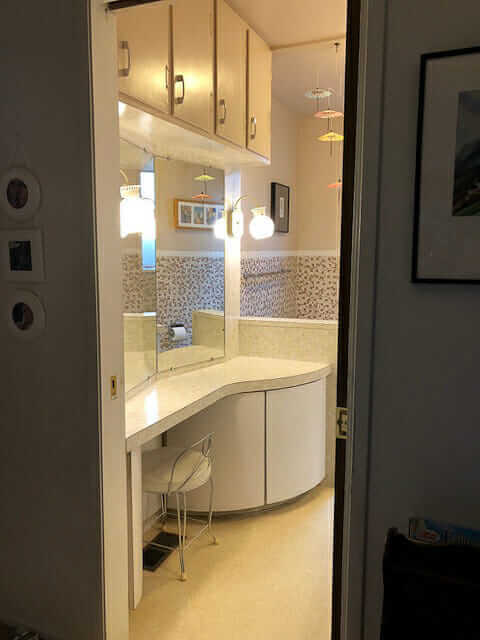 When we walked into the bathroom I told my husband the only thing I would change is the light fixtures (which if we can find vintage lights we like better we may still change) but everything else we love. The lights are a bit of a hazard as they are head height for me and I have knocked my head on them all at one time or another. Besides that we liked it. I’m not a huge fan of brown so I would have liked another color but we both love the tile pattern so much that we have talked about how if we do have to have any plumbing repair I will try to clean off the grout so we can replace them. We took some advice I read on your site about living in your house for a year before changing anything and that has been great. The paneling wall in our living room that I didn’t love at first has really grown on me. 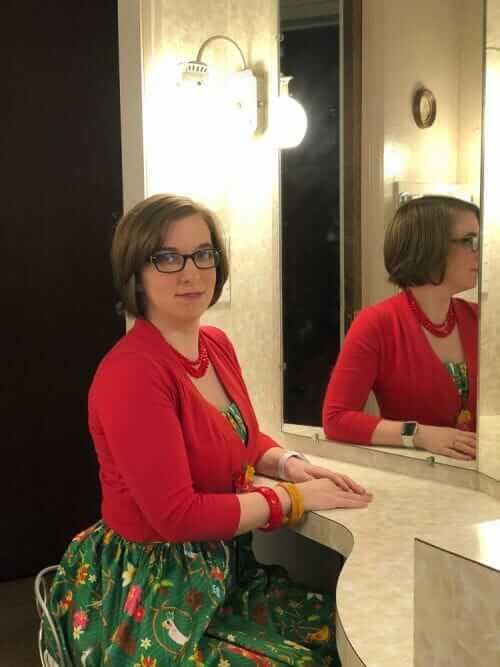 I also asked Laura what folks said when they saw the bathroom — and what she and her family thought about it when they first saw it and bought it. We get a lot of “Oh wow!” Or “It takes me back to my childhood” from my mom and her siblings. 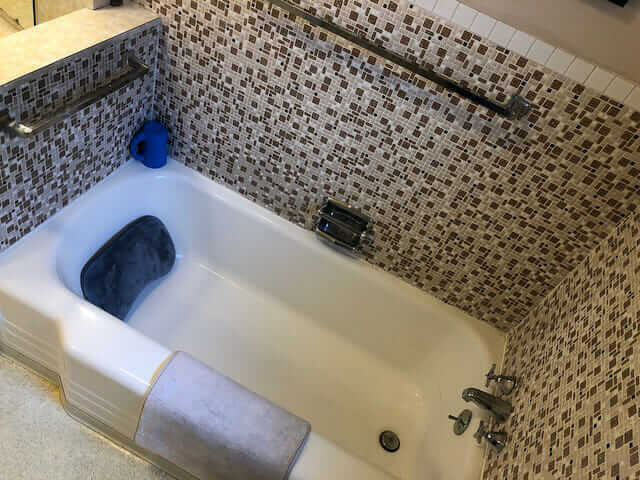 The funny thing is before we saw the house for the first time the realtor said we would probably want to update the kitchen and bathroom…haha. Nope! 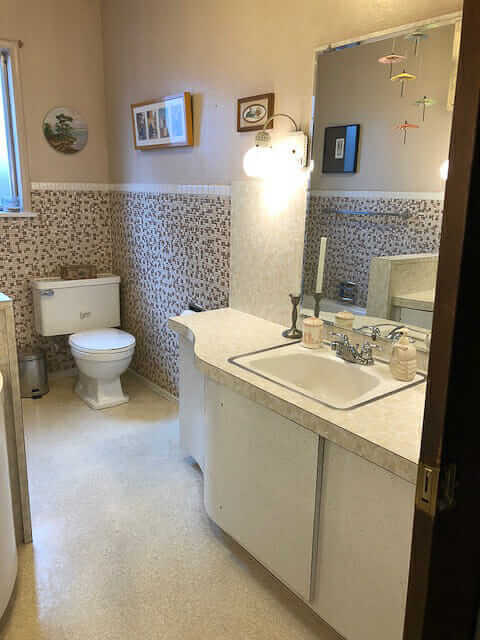 We had been hunting for a house with some character and age and everything we saw with age had been renovated in the 80s (possibly my least favorite home decor period!) so we were thrilled to find this. 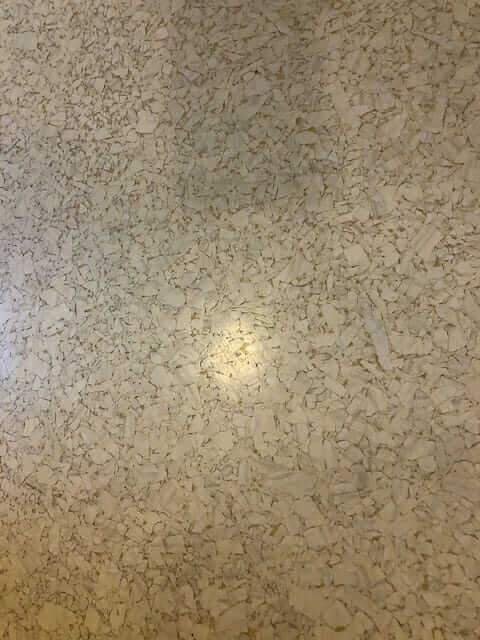 Most of the flooring in the rest of the house has been updated before our time here but we think that maybe this linoleum is original. 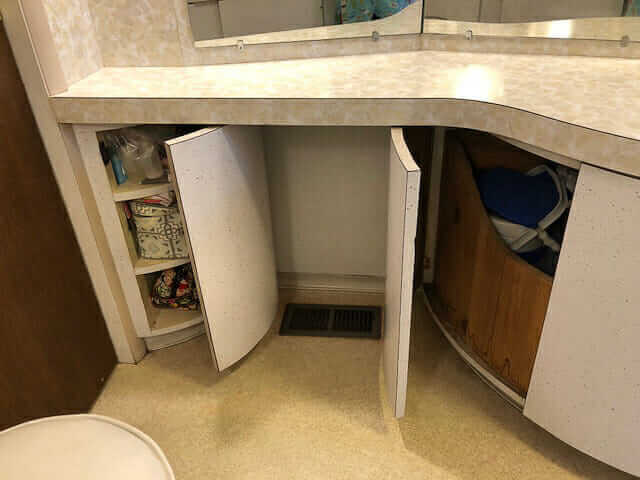 There is tons of storage in this bathroom over and under the vanity and under the sink. My favorite is the cabinet across from the toilet for storing toilet paper. There is also a big laundry bin at the vanity but we mostly use it for storage as we have hampers in our rooms. My mother in law gave us the vanity stool as a house warming gift. … and the last one is the flooring. 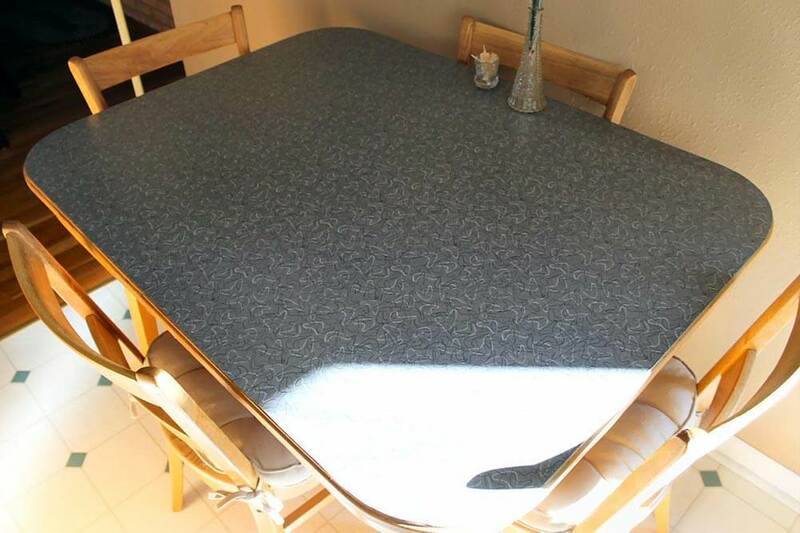 We have tons of different Formica all over our house and it’s all fantastic! Let me know if you have any questions! I have been a fan of the site since you featured my friend Betty Crafter (our moms were best friends when I was growing up). Fantastic, Laura, in every way! 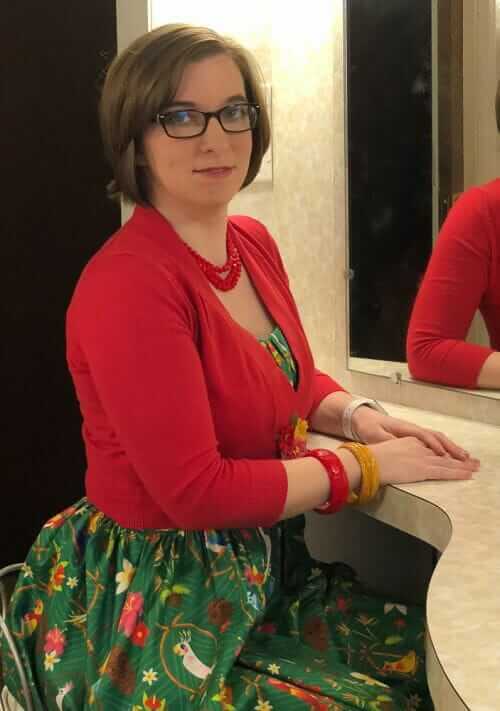 Thank you so much for sharing your bathroom with us — and thanks for setting up and taking your lovely retro portrait at my request! You got it goin’ on! Ben Sander transforms a blah 1980s kitchen and bathroom — back to the 1970s! 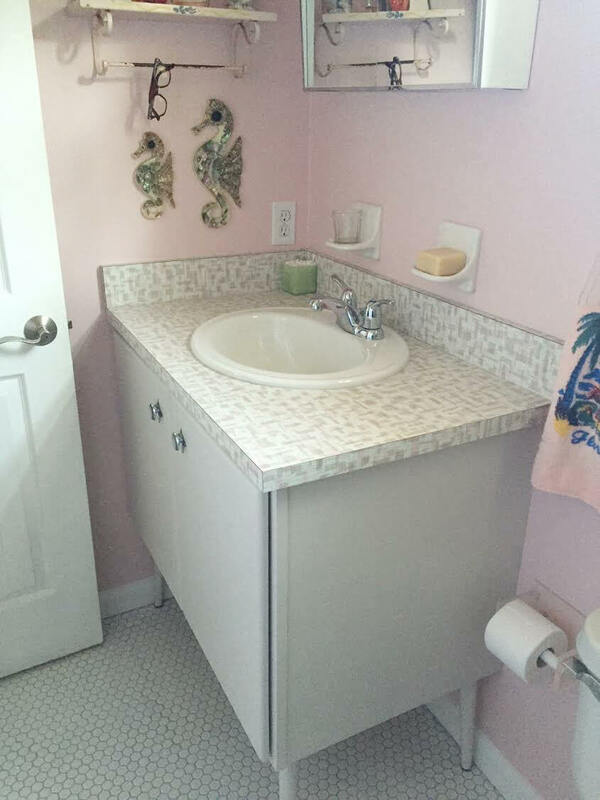 Chris uses Wilsonart Endora laminate in her retro pink bathroom — looks great! I love the flooring! Any clue about the manufacturer or if there is anything similar currently available? Have a look in the previous comments. Brian commented about where it can be found still. 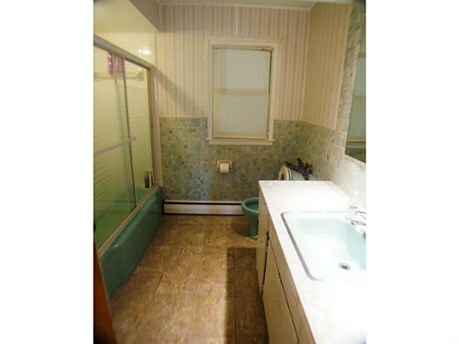 What an awesome original bathroom. I also really like Laura’s 1957 style with the iWatch. Very Jetsons! Love this bath! My mid-sixties house in Texas has that exact same Formica (Wilsonart?) 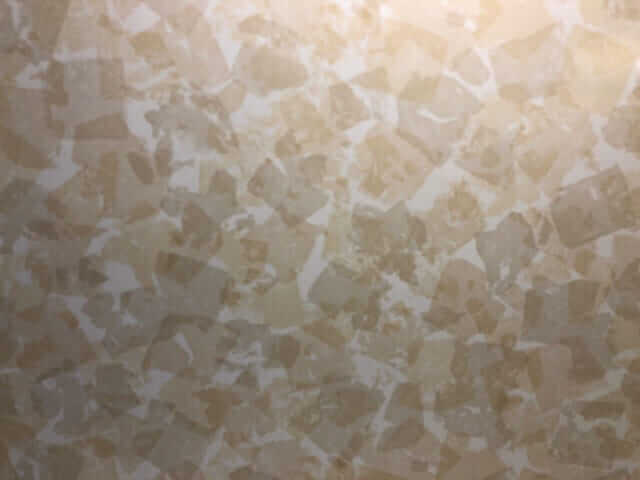 for countertops and back splash. I’d love to know the pattern name. Congrats, Laura, on this sweet home match. I also ADORE that hand towel!